Re-brand successful company without compromising share-of-mind. Wind River makes software for embedded systems: the tiny microprocessors that can be found in such diverse applications as automobile anti-lock braking systems and VCRs. Traditionally viewed as a tool provider for building larger systems, they had developed a suite of tools for the networking equipment market and wanted to change their perceived image within that market. Wind River Systems contacted ChannelWorks, who enlisted the help of M7 and Wardog creative to develop the company’s first high-level marketing piece, a six-page brochure. 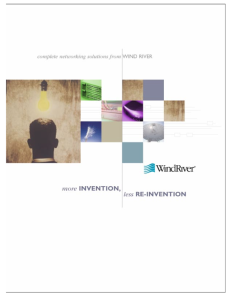 The brochure promotes the that fact Wind River’s solutions can give networking customers a time-to-market advantage and allow them to devote more development time to creating differentiating product features.